Rustic DIY Wedding Ideas On A Budget and some wedding photos! For the last few weeks, I have been sharing Rustic DIY Wedding Ideas on a budget that we have made for our daughter's wedding this summer. 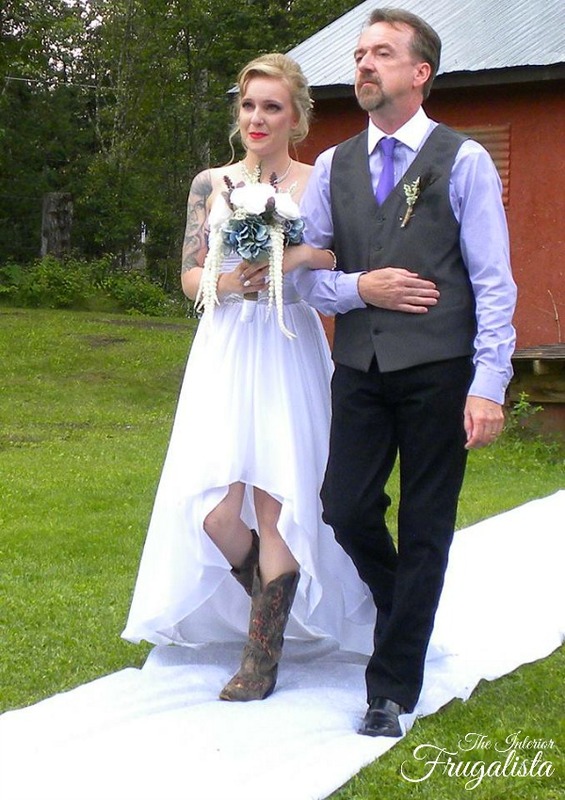 The operative words for this wedding were Handmade, Rustic, and Budget Friendly. A comment I received often throughout this series was "looking forward to seeing photos from the wedding". Well, friends that day is today! 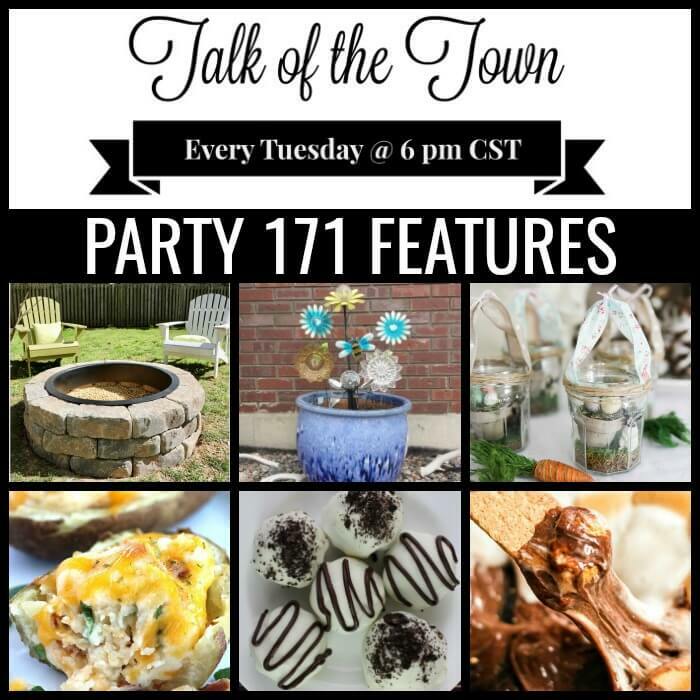 You may want to grab a beverage because this post is heavy on the photos! But first I must apologize for the quality of some of the photos. I didn't pack my big girl camera nor did I have time to take pictures with my iPhone, so some of these photos I borrowed from guests. 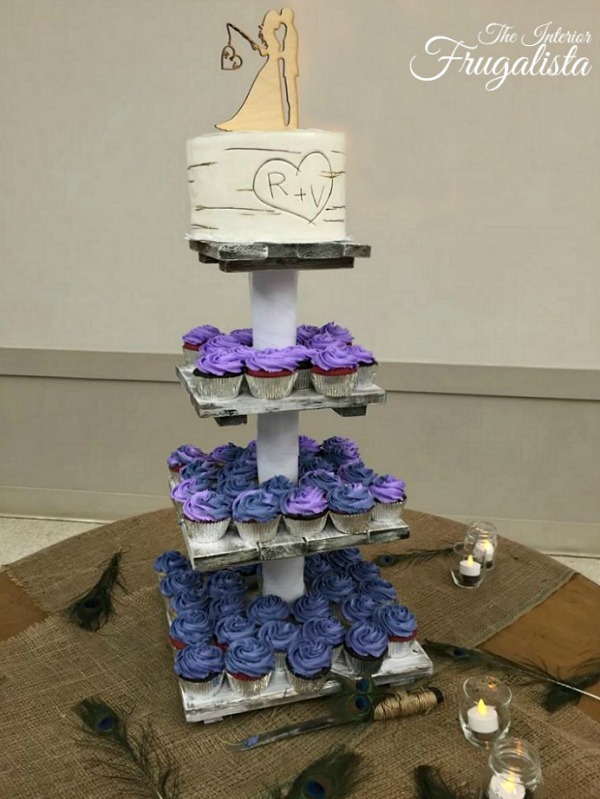 We made it 4-tiered so it could hold enough cupcakes for each guest to enjoy after dinner. Being quite large, it was made to be transportable and assembled on site at the reception hall because the wedding was a 9-hour drive from our home. The beautiful whipped vanilla, chocolate, and red velvet cupcakes were made by a sister of the groom and delicious too! What we didn't take into account when building the stand was that the Bride and Groom are vertically challenged and had to go on their tip-toes to cut the cake! This photo of them cleaning each other's faces was taken after rubbing cake, blue velvet no less, into each other's faces. Too cute! Here is a close up of the custom Carved Love Heart Birch Log Wedding Cake that went on the top tier of the cake stand. 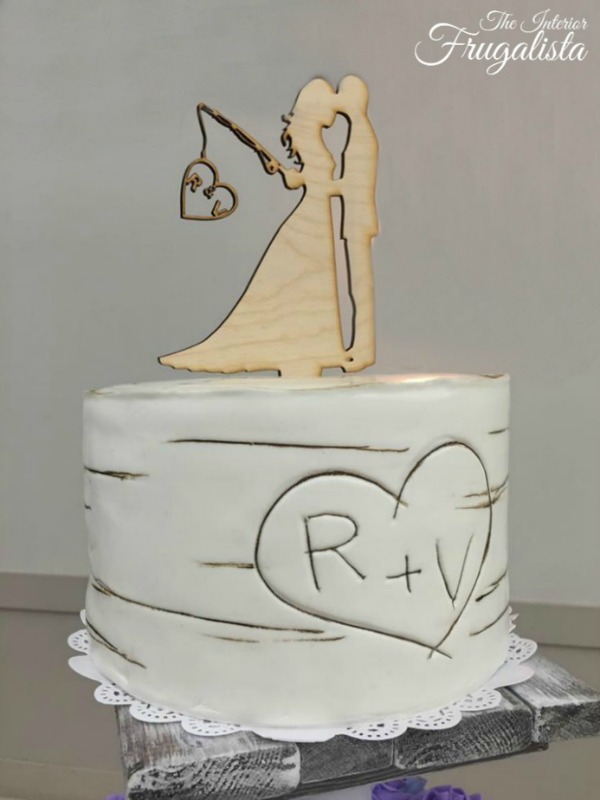 The adorable custom Wedding Cake Topper was ordered from a Canadian Etsy Shop. 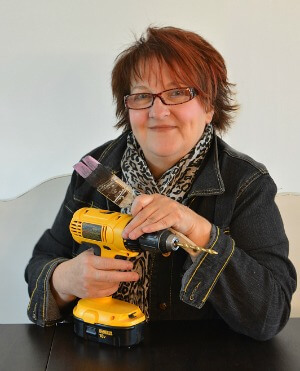 If you missed the post in the series of how we made the stand, you can catch it here at Rustic Wedding Cake and Cupcake Stand. Some of the items used to create these projects may be unfamiliar to some of you. 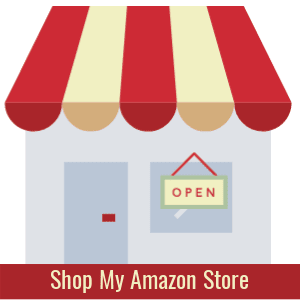 I've included affiliate links in this post so you can see what they are. Click HERE to read my disclosure policy. The wedding card box was quite large and could hold between 80 - 100 cards. Now that the wedding is over, the lid was removed and the Bride and Groom are repurposing it into a garden caddy. If you missed the post in the series where I shared how we made it, you can catch it here at DIY Rustic Wedding Card Caddy. 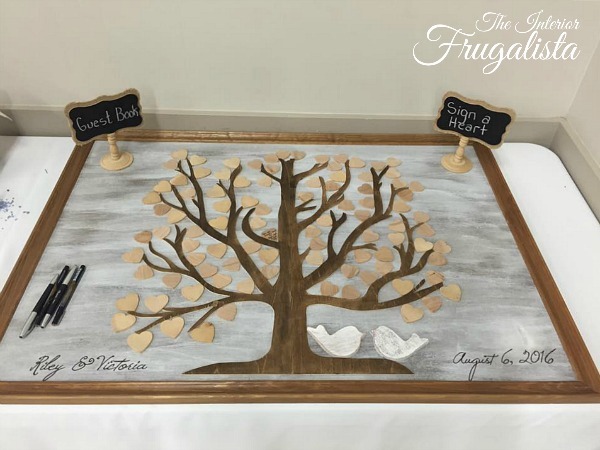 Also on the guest table was a framed Wooden Tree with (*affiliate link) heart leaves, an alternative to a traditional guest book. We didn't invent the wheel on this one as we were inspired by others found on Pinterest but we put our own spin on the idea. Now that it's signed by their guests, we put the plexiglass back on the front and the Bride and Groom plan on hanging it in their home. I didn't write a post about this DIY because there just wasn't enough time in the day the weeks leading up to the wedding. 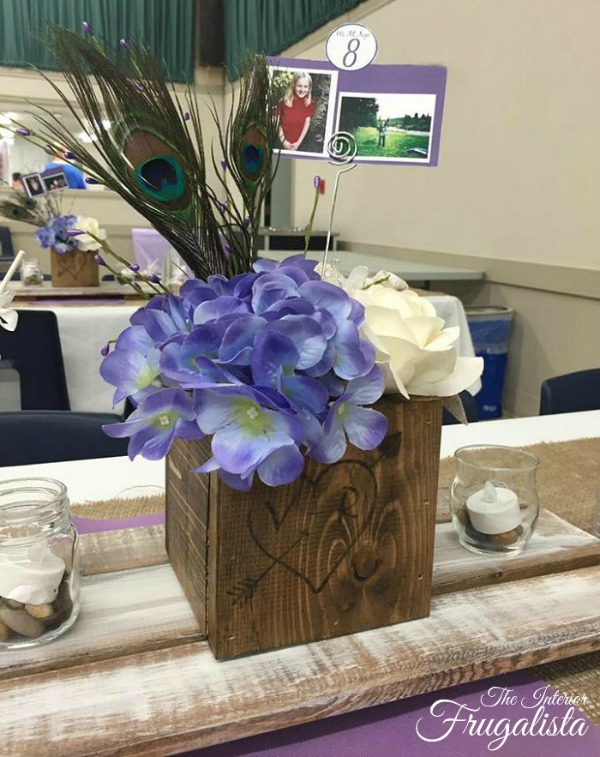 The wooden centerpiece boxes were built from wooden fence boards and so inexpensive to make but offered Wow factor on each table. They were placed on top of whitewashed wooden trivets for added impact. The cute table number card idea was also inspired from Pinterest and I made them in PicMonkey and printed them onto (*affiliate link) double sided matte photo paper. 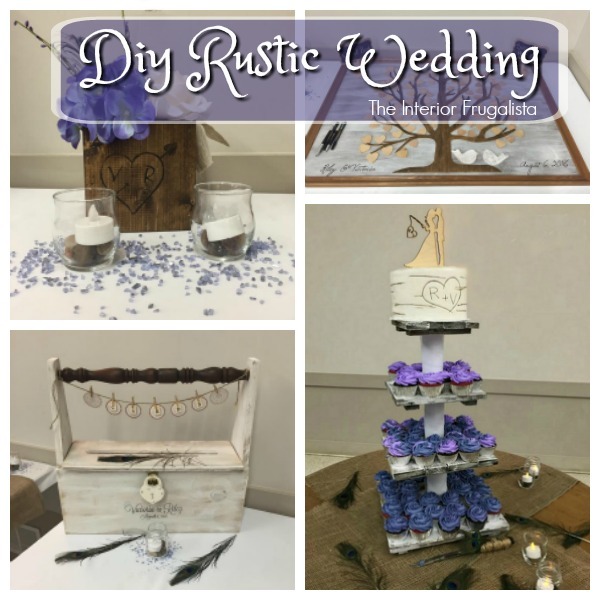 You can catch the tutorials on how we made them here at Rustic Centerpiece Boxes and Rustic Wooden Centerpiece Trivets. Also included are the adorable Bride and Groom Flower Pots that flanked the aisle at the wedding ceremony and later on the steps of the hall. 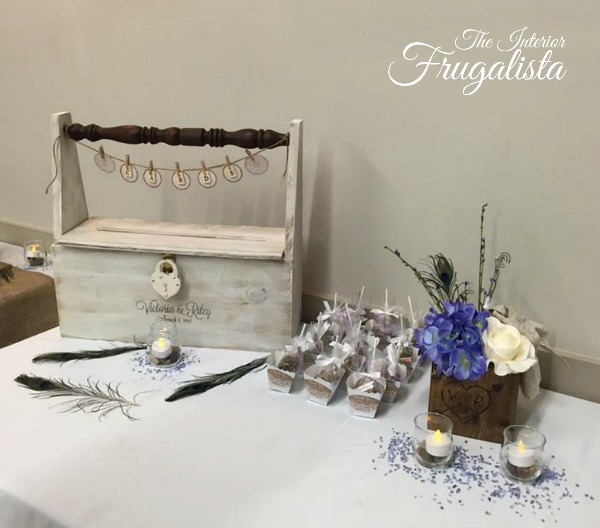 Next to the guest table were (*affiliate links) mini galvanized buckets purchased from the dollar store to create a fun Candy Bar for the young and old to enjoy. Each bucket was filled with assorted candy in the colors of the wedding. We also rented a Popcorn Machine and Snow Cone Machine for during the dance. Sadly, I never got pictures of those. 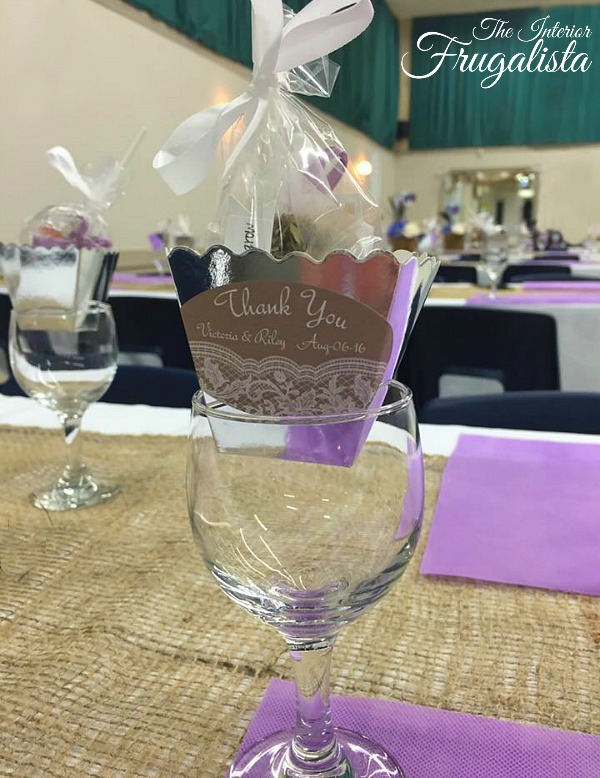 The guest favors included a (*affiliate link) mini glass vial with Lavender seeds, Lavender infused tea, and a homemade lavender infused sucker. The Lavender Infused Suckers were made by me and surprisingly turned out after my second attempt. 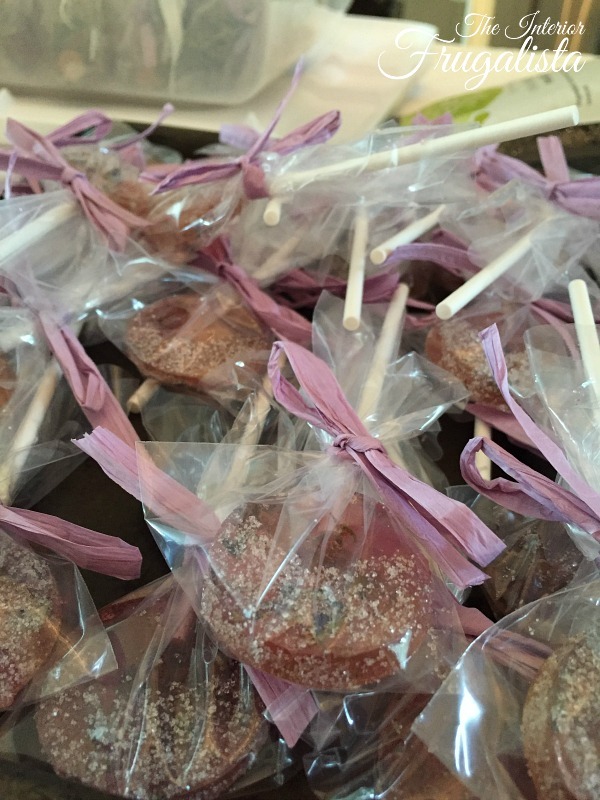 I've never made hard candy before but the recipe I found at Garden Therapy was very easy to follow. 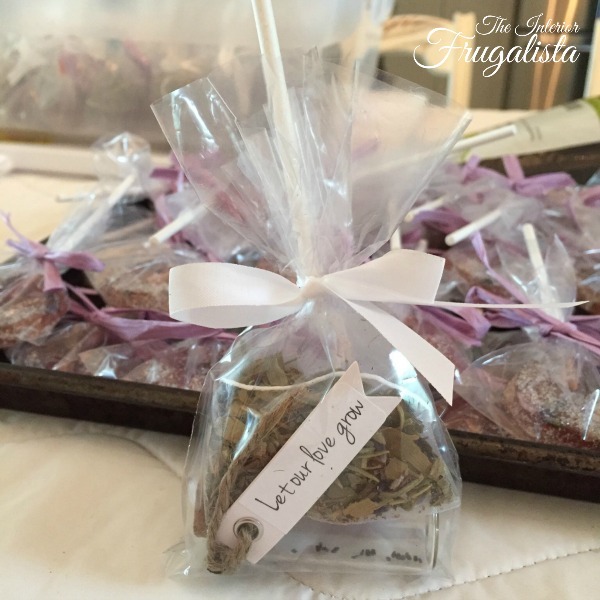 I used (*affiliate link) Culinary Lavender Flower Buds and dipped each sucker into (*affiliate link) Lavender Infused Sugar. This was a hit! Starting from the left is my son's girlfriend (who also caught the bridal bouquet - could that mean there is another wedding in our future), my son being his usual silly self, and Moi. The idea was found yet again on Pinterest and it was so easy to make using a large sheet of corrugated plastic suspended from the ceiling with ribbon. The props I got from the dollar store and embellished them with things I had in my craft bin. I placed them all in a galvanized bucket on the floor beside the photo booth. 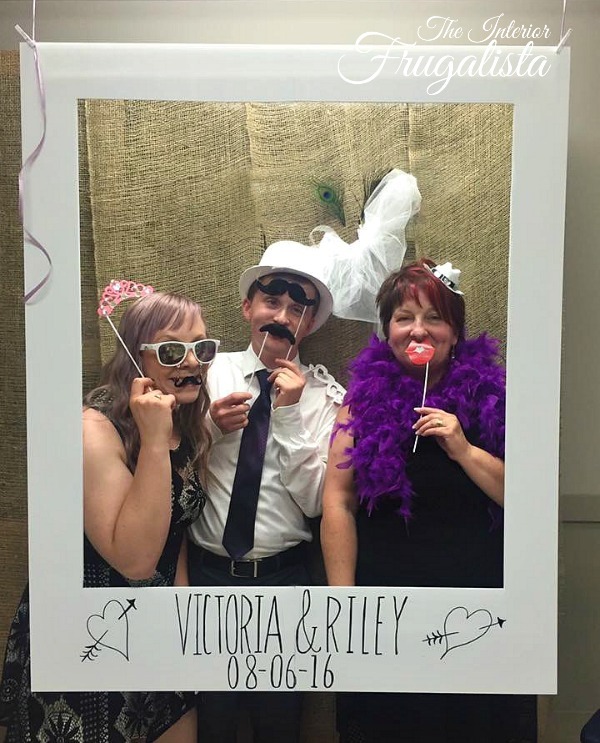 The Bride and Groom created a #hashtag for their wedding so pictures from the photo booth and beyond could be easily shared on either Facebook or Instagram. 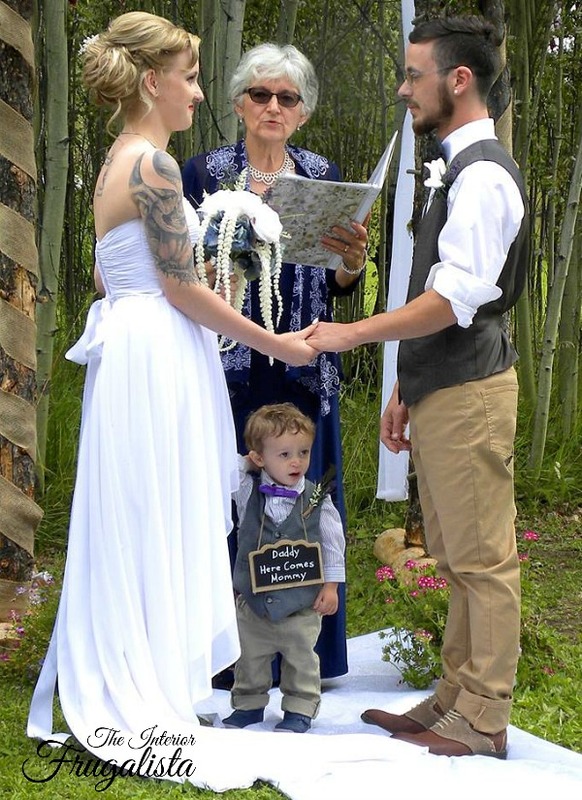 I couldn't end this post without a photo of the Bride and Groom or I know I wouldn't hear the end of it from you guys. Our adorable 16-month old grandson, who had to forego his afternoon nap, decided if my Mom and Dad are getting married then I'm getting married with them! I know you're going to ask to see the front of our daughter's dress so here is a picture of Mr. Frugalista walking her down the aisle. They had us all crying! If you closely at the photo, you can see wet spots all over Mr. Frugalista's vest. 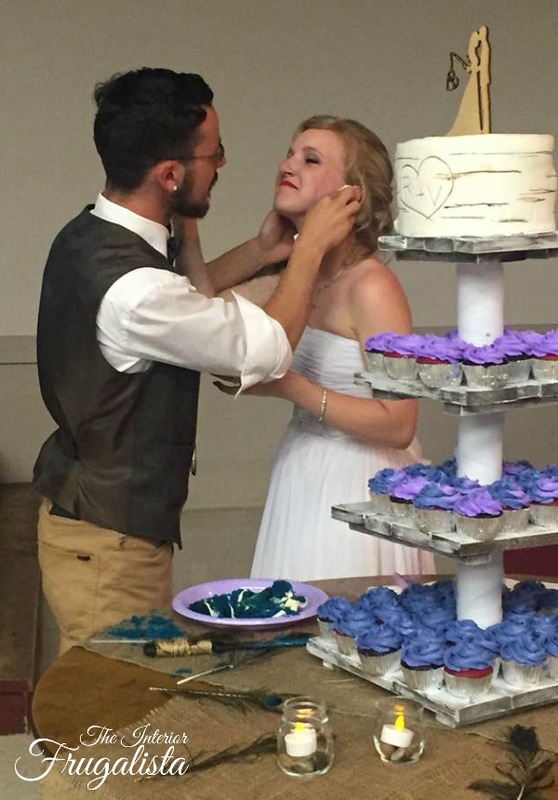 No, he wasn't crying that hard but it rained moments before the ceremony. As our daughter walked down the aisle the skies parted and the sun came out for the rest of the day. Call it serendipitous but I say Angel's were among us that afternoon! 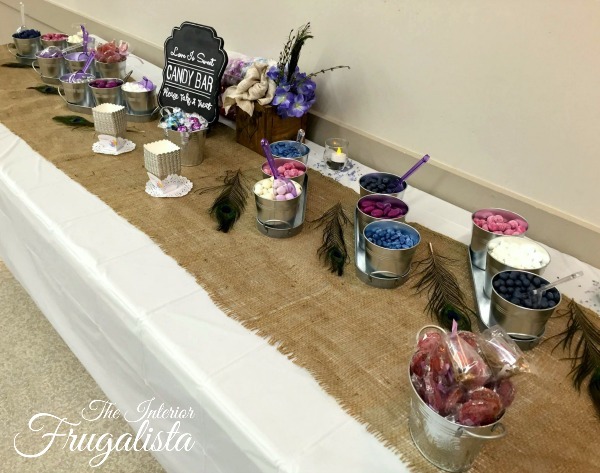 I hope you enjoyed my Rustic DIY Wedding Ideas on a budget. I hope that those of you who have upcoming nuptials or someone you love, that this series has inspired you in some way. What was your favorite Wedding Décor item from the series and why? I'd love to hear about it.